Eltronicschool. - This is one free and open source software for you who want to do design for your electronic circuit in this time. 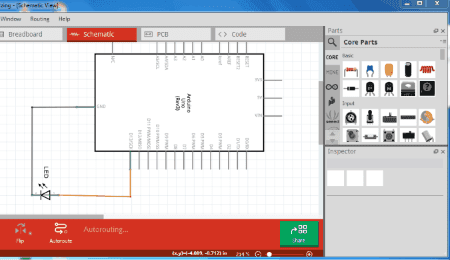 This software is called with Fritzing circuit design for Windows, Linux, and MAC. In this time, we will give you global description about this Fritzing software, and then we will give you the link to take free download Fritzing Circuit Design Software for Windows and MAC from external server. From Listoffreeware site describe that Fritzing is an open source circuit deign software for Windows. This is a free software which needs no installation. When you open this freeware, you land on a welcome page. The welcome page asks if you want to create a design, or open example. On the right side of the UI, you can see the Tools menu. The list of components include: ICs, Resistors, Diodes, Gates, Switches, Wire, Junctions, etc. Click on a component to view its description at the bottom. You can even add a Note, or rotate the PCB board. When the PCB design is complete, save the file as .FZZ format. You also have the option to export circuit design as PDF or Image. You can view your design is various modes: Breadboard, Schematic, PCB, and Code. The Code mode lets you write your own code, and feed it to the ICs such as Micro Controllers or Micro Processors. An online Help page is available in case you are having any kind of trouble with this free circuit design software. And now you can click the links below to take free download Fritzing Circuit Design Software for Windows and MAC from external source easily.